Just wanted to brag that I’ll be one of the first people in the world to read “Personal” on 28th August 2014. I’ve ordered it on Kindle and it’ll be delivered automatically. Within 120 minutes I will have finished it. This entry was posted in Uncategorized by Sheldon Nesdale. Bookmark the permalink. 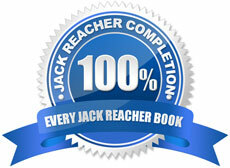 Just finished Lee Child’s latest Jack Reacher novel: “Personal”. Loved it! I’m so addicted! Hi, I'm Sheldon Nesdale, and even though I have a wife and 3 kids I'm in love... with a man... and his name is Jack Reacher. That's right, I Love Jack Reacher. And I'm not even shy about it. My wife knows. I just can't help it, I'm just totally addicted to his stories. "Jack Reacher doesn't want to put the world to rights. He just doesn't like people who put it to wrongs." Do you qualify for the 100% club yet?